On July 17th, the evening prior to the official kick-off of the Republican National Convention, Cleveland – The Rock and Roll Capital of the World – will see a party unlike any they have ever seen as Rock and Roll Hall of Fame icons Lynyrd Skynyrd will provide entertainment for the “Welcome To Ohio Late Night” party held at The Auto Lot, a pop-up venue in downtown Cleveland and hosted by Ohio Speaker of the House Cliff Rosenberger. Local Ohio foods will be on hand, as well as local beer presented by the Ohio Craft Brewers Association in partnership with Thirsty Dog Brewing Company. The event is produced by Blue Star Productions, LLC in conjunction with the Green Beret Foundation, The Folded Flag Foundation, The Guardians of Heroes Foundation, OH Fallen Heroes, and SRT-K9 Unit, with those military charities receiving proceeds from the event. The band’s story took a tragic turn in October 1977 when a plane crash took the lives of Van Zant, Steve Gaines, backup singer Cassie Gaines, and several of their road crew. The band took a decade-long hiatus before reuniting for a tour and live album, Southern by the Grace of God. Since then, the band has toured and recorded extensively, with their most recent release being Last Of A Dyin’ Breed. 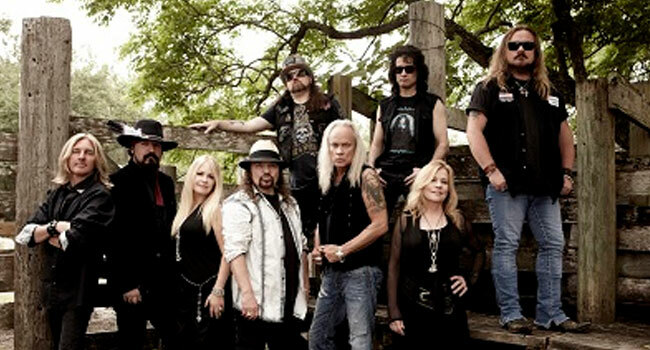 The band’s current line-up includes original member Rossington, Johnny Van Zant, Rickey Medlocke, Mark “Sparky” Matejka, Michael Cartellone, Johnny Colt, Peter Keys, Dale Krantz Rossington and Carol Chase. The band was inducted into the Rock and Roll Hall of Fame in 2006.